Trees are essential to any property. Trees, especially evergreens, can add privacy and shade to your lawn and garden. Beautiful deciduous trees like Canada Reds or Aspens create much needed height variation to a garden bed. Another great option is fruit trees. Plum trees and apple trees have beautiful blooming flowers in the spring before they begin to generate fruit. Earth and Eden has a wide array of fruit trees including pear trees. From Swiss Stone Pine to Blue Spruce trees and Aspens, come check out our tree selection today! 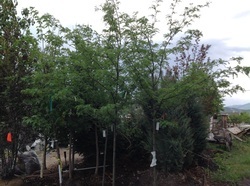 Come check out our shrubs! Shrubs - Many times planted along fences or homes, shrubs are drought tolerant, grow in sun or shade, and are a perfect way to accent flowers and trees. One particular shrub, the Dogwood, comes in many different varieties and suits numerous settings. Earth and Eden carries unique shrubs such as the Diablo Ninebark and the Snow Mound Spirea. Purple and dark, the Diablo Ninebark blossoms with beautiful flowers. This shrub even looks good in the winter time. Accenting your lawn and garden with shrubs will make for a nicely differentiated landscaping appearance. Vegetable starts ready for your garden! Vegetables - Tomatoes, pumpkins, and squash oh my! From vegetable starts and seeds for any garden to local planting and growing advice, we can help you create that beautiful vegetable garden or planter box. We even can provide advice on your vegetable planting according to local growing conditions and what may work best. 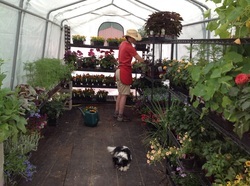 Our greenhouses are filled with vegetables. It’s never too late to plant out that vegetable garden.